The Europark is a shopping mall in the outskirts of Salzburg, not far from Liefering. It is the biggest shopping mall in the West of Austria and its modern architecture make it an attractive addition to the historic core of Salzburg. The building uses a lot of glass and open spaces. The surroundings of the building try to integrate the landscape and have recreational green areas to fake natural beauty to the shopping-mad crowds. The Roman architect Massimiliano Fuksas was responsible for the design of the Europark. His design won a competition in 1994, the original Europark was opened in September 1997 and the building was extended in 2004 until autumn 2005. Not only a shopping mall in the traditional sense, it also includes parks and recreational areas in the surroundings and aims to make "shopping" a well-rounded experience. It can be doubted whether that is achieved, after all the Europark is simply a shopping mall, but a piece of contemporary architecture of that size clearly is an achievement in a city like Salzburg. In 2004, the then 80 stores of the Europark had a total revenue of 203,3 Million Euro. This makes 8800 Euro per year and squaremetre - the top result in all of Austria. The recent addition to the Europark contained the so-called "Oval", a section with a round stage and seats for 250 people. It aims to host cultural events such as concerts, cabaret or film festivals. The current size of the Europark is 50 000 square metres, with additional 20 000 square metres in a neighbouring, but integrated IKEA. Since the extension of 2005, it hosts 130 shops and provides parking space for 4 500 cars. 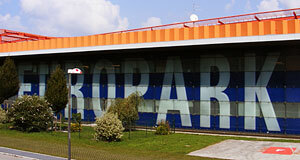 The Europark is easily accessible by the city buses and - since 2009 - by regional trains.